Despite an unemployment rate that averaged 4.1 percent over the last 12 months, the average real (inflation-adjusted) wage of private sector workers did not grow at all over this period. Part of the reason is an increase in energy prices, which is likely to be temporary, but our slow wage growth has mostly been driven by nominal wages failing to rise quickly even in the face of low unemployment. One explanation worth looking into is whether today’s low wage growth is due to a composition effect—i.e. low-wage jobs being added faster than middle- and/or high-wage jobs and, as a result, pulling down wage growth. Composition was certainly a factor during the early part of the recovery from the Great Recession. In the first few years of the recovery, the jobs being added were very disproportionately low-wage jobs, which had the effect of pulling wage growth down over that period. But since 2013, as the recovery has strengthened, the opposite has been true—low-wage jobs are actually declining on net while middle and high wage jobs are being added, which has the effect of raising average wages. 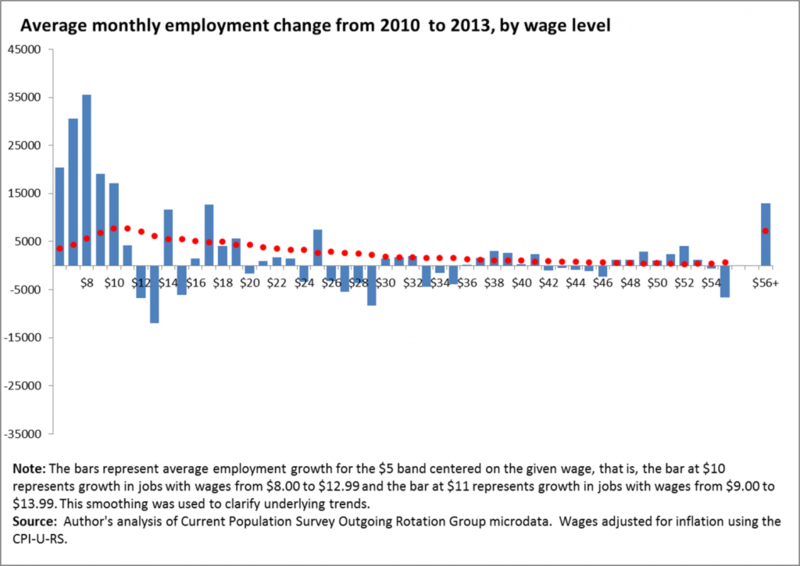 In other words, the composition effect is currently putting upward pressure on wages. The two charts below show this shift, by showing job growth across the wage distribution from 2010 to 2013 and from 2013 to the present. The dots on the charts are provided as benchmarks—they show what employment growth would have been at each wage level if jobs had grown at the same rate across the entire wage distribution. Thus, if a bar is above its dot, job growth was faster than average at that wage level, and conversely, if a bar is below its dot, job growth was slower than average at that wage. The two charts show a clear shift in the pattern of job growth. In the first few years of the recovery, the economy produced rapid job growth in low-wage jobs and weak growth in middle-wage jobs. But since 2013, the economy has shifted to a pattern of stronger growth in middle- and high-wage jobs and slower than average growth at the bottom. The basic shape of the second figure does not change if the time period is restricted to the last year alone; we used the longer period to emphasize the major shift in job growth patterns that occurred in 2013. 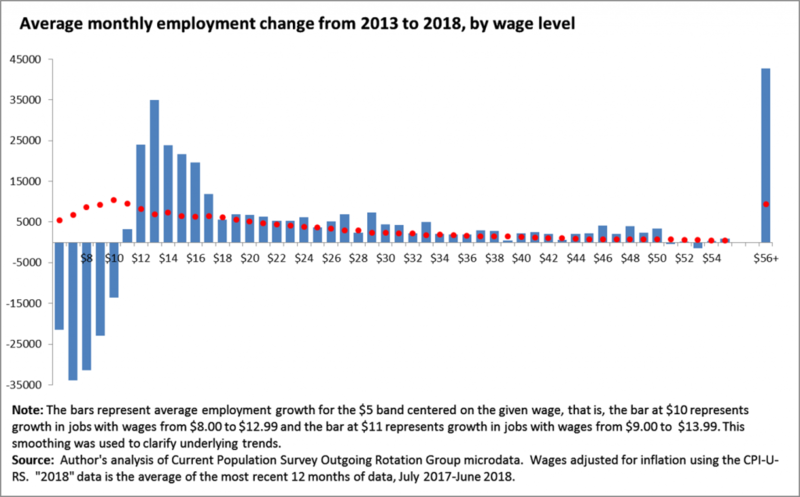 What these figures show is that the composition of new jobs is not what is keeping wage growth so sluggish right now—instead, we are simply seeing sluggish wage growth within a wide variety of job-types. Why? In a previous blog post, we also showed that it is not lack of worker skills that is keeping wage growth low. What is most likely happening is that worker leverage and bargaining power have been so decimated by policy choices—policy choices that have, for example, led to the erosion of union coverage and labor standards like the minimum wage—that for tight labor markets to spark upward wage pressure the economy requires a much lower unemployment rate now than it did in the past. The solution is clear: we need the Federal Reserve to allow the unemployment rate to continue to drop, and we need policies to shift bargaining power back to workers.